Many people would want to have flawlessly radiant skin. However, only a few people actually have naturally perfect complexion. Regardless, everyone seems to have a skin condition that they struggle to manage. In line with this, facial steaming has become one of the hottest trends in skin care today. With the best facial steamer for acne, blackhead and skin care, you can achieve softer, clearer and more youthful skin. If you are looking for an easy and convenient way to improve your skin, read on to discover the best facial steamers for you! A facial steamer or facial sauna is a cosmetic device that is used to improve the health of the skin, especially in the face and the neck. If you have visited salons and spas, you may already have seen professional-grade facial steamers. This cosmetic device produces steam to heal and soothe the skin. Water is often incorporated into the device and used to produce warm steam. Aromatherapy oils, on the other hand, may also be added to the water to improve the effects of the steaming. To use this device, you simply have to rest your face near the top portion of the device and allow the steam to wash over your face. So, What are the Benefits of Facial Steaming? Regular application of warm steam to the face is not only and effective beauty regimen but also a beneficial one. Whether applied during your visit to the spa or at home using the best face steamer, facial steaming offers multiple skin health and beauty benefits. Improve Circulation. Whenever your temperature increases, the brain signals the body to initiate a thermoregulatory response. As a result, the blood vessels in the skin will dilate to ensure to more blood flow to let the heat off. With increased blood flow, more oxygen and nutrients are delivered to the skin tissues. Efficient Hydration. Steam is good for your skin as it can hydrate and increase the skin’s permeability. In addition, the moist heat can effectively revive tired skin and sustain the absorption of your skin care products, which ultimately increases the suppleness of the skin. ​Increase Perspiration and Cleansing Ability. Another benefit of facial steaming is efficient skin cleansing through increasing perspiration. When your skin perspires, your sweat will remove dirt, dead skin cells and other debris that may lodge into the skin pores. ​Anti-aging Benefits. With the use of facial steamers, dead skin cells are easily removed. As a result, the skin will appear fresher and younger looking. Prevent Sebum Buildup. Sebum, natural skin oil, protects, moisturizes and lubricates the skin and hair. When sebum builds up due to blockage in the pores or excessive sebum production, acne breakouts can occur. That being said, Facial steaming can help prevent sebum build up because it softens blackhead plugs and promotes natural sebum production and flow. Facial steamers come in different makes and models. However, most of them offer the same basic functionalities like generating steam and supports the face during the process. On the other hand, some models come with additional customizable features. If you are looking for the best facial steamer, you should consider the following factors. Efficiency. The best face humidifier are those that offer efficiency and consistency during operation. That being said, most facial steamers take about a few minutes to warm while there are also others that start working within seconds after being powered on. If you are always on the rush, you should consider purchasing a facial steamer that can heat up in just a few seconds. Design. Some facial steamers come in a sleek and sophisticated design that can actually double as an aesthetic ornament in your bathroom counter or your dresser drawer. Also, you should consider storage capability of the steamer if you plan on storing it for later use. The OKachin Gliya NanoSteamer offers a unique facial steaming experience right in the comforts of your home. In fact, this facial steamer is designed to utilize ultra-fine Nano-sized particles to ensure deep penetration of the skin. Also, this technology ensures effective supplement moisture is applied to the skin. This facial steamer produces tepid steam that can help melt way dead skin cells, allowing nutrients to be absorbed by the skin. Also, this device can activate the hydrophilic factor of the skin and replenishes water on your skin which ultimately promotes collagen regeneration. This device can ultimately restore your smooth and delicate skin and improve its nutritional absorbency. In addition to its facial steaming functionality, this device offers other functionalities like a makeup mirror and humidifier. This facial steamer is definitely the perfect partner for your skin. This device can effectively clear blackheads and acne. With its hot mist, your skin will be moisturized and deeply cleansed. This facial steamer makes use of advanced Positive Thermal Coefficient (PTC) ceramic heating element to produce steam out of clean water. This device produces ample micro fine steams and ensures deep penetration into all layers of your skin. In addition, nano steam along with ionic water particles is ten times more effective in penetrating the skin than regular steam. This device makes nutrients more absorbable to the skin and restores smooth and delicate skin condition. In addition, this device also promotes collagen regeneration. This facial steamer does not cover the entire face during the steaming process so you need to turn your face from side to side. Also, leaking may be a bit of a problem if this device is mishandled. This facial steamer is effective and efficient. In fact, the Kinga Hot Mist Facial Steamer heats up rather quickly allowing you to enjoy the facial steaming experience in seconds after you powered on the device. Also, this steamer is designed with highly miniaturized Positive Thermal Coefficient ceramic heating element which allows it to produce a powerful visible steam. The steam produced, however, may be too hot for some people and users should use the device with caution. This steamer also comes with a UV lamp which lights up the steam outlet hole and serves as an indicator. The device, on the other hand, does not cover the entire face during the steaming process and may require you to turn your head from side to side. Ultimately, this facial steamer promotes a healthier and smoother skin through allowing efficient nutrient absorption and collagen regeneration. This facial steamer is a three-in-one personal steamer that offers quick and efficient skin spa-like treatment. This device comes with the advanced miniaturized positive thermal coefficient ceramic heating element to efficiently vaporize clean water and produce a strong and visible steam in almost instantly. Also, this steamer is designed with a high-tech ozone function which sterilizes the steam so it is in its purest form when it reaches your skin. This device also comes with an automatic shut-off timer and nano ionic hot mist sprayer. If the device is held to close to the face, hot steam may shoot off. Thus, it is best to take caution when using this device. This facial steamer is one of the best ones in the market today, as it can effectively provide you that gentle and warm steam to moisturize your skin. This steamer produces nano ions that penetrate your skin deeply to quickly moisturize it. Also, it makes use of Positive Thermal Coefficient ceramic heating element to vaporize water and produce a visibly strong steam in an instant. This steamer produces hot steam when held very close to the face. Thus, it is best to keep your face at a certain distance when using this device. Also, you should turn your face from side to side during steaming, as this device does not cover the entire face. Choosing the best home facial steamer will depend on your needs and preferences. 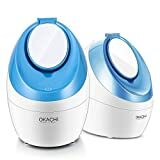 However, if you are looking for one of the best ones in the market today, you should consider checking out the Okachi Gliya NanoSteamer. This facial steamer is the perfect partner for your skin. In fact, this facial steamer can effectively moisturize your skin, remove dead skin cells, promote collagen regeneration, and increase nutrient absorption. Also, this device is very easy to use and assemble. If you are looking for a spa-like treatment at the comforts of your home, this device may just be the one that you are looking for.